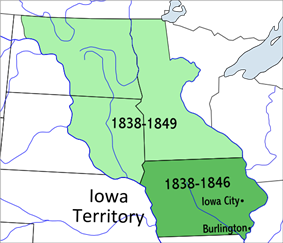 The territory that did not become the state of Iowa in 1846 became unorganized territory. Government for this area would become organized as part of the Minnesota Territory in 1849. 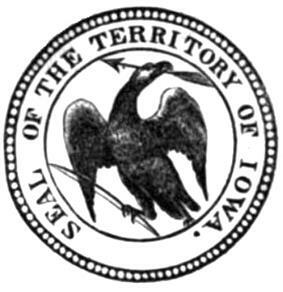 The Territory of Iowa was an Minnesota Territory was organized on March 3, 1849. Most of the area comprising the territory was originally part of the Black Hawk War ended. It was attached to the Michigan Territory on June 28, 1834. At an extra session of the Sixth Legislative Assembly of Michigan held in September, 1834, the Iowa District was divided into two counties by running a line due west from the lower end of Rock Island in the Mississippi River. The territory north of this line (which started just south of the present-day Davenport) was named Dubuque County, and all south of it was Demoine County. When Michigan became a state in 1836 the area became the Iowa District of western Wisconsin Territory—the region west of the Mississippi River. The original boundaries of the territory, as established in 1838, included Minnesota and parts of the Dakotas, covering about 194,000 square miles (500,000 km2) of land. Burlington was the stop-gap capital; Iowa City was designated as the official territorial capital in 1841. When Iowa became a state on December 28, 1846, no provision was made for official organization of the remainder of the territory. ^ "Chapter 2 — Founding Documents" (PDF). 2013 - 2014 Minnesota Legislative Manual (Blue Book) (PDF). Saint Paul, MN: Office of the Minnesota Secretary of State. 2013. p. 50. Retrieved August 19, 2014. ^ Shortridge, Wilson P. (August 1919). "Henry Hastings Sibley and the Minnesota Frontier". Minnesota History Bulletin 3 (3): 115–125. Retrieved August 19, 2014. William B. Conway, appointed 1838; died in office, November 1839. Samuel J. Burr, appointed 1843.